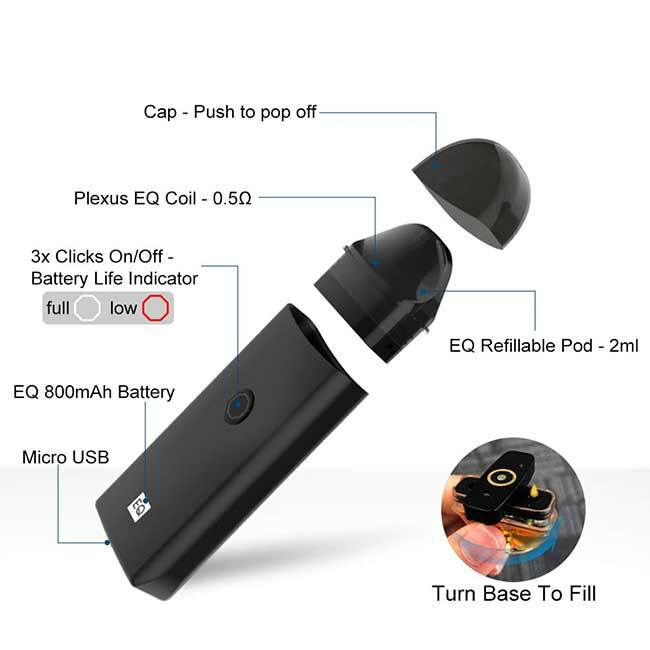 The Innokin EQ Starter Kit is a compact pod system that uses Plexus mesh coils for an outstanding mouth-to-lung vape on the move. Super easy to use, ideal as a first e cigarette alternative to smoking cigarettes. With an extra-compact design, the EQ features a 0.5 ohm plexus mesh coil with rapid heat diffusion which increases coil life. The EQ can be vaped in two modes - regular (12.5W) or boost (15.5W). Refilling your EQ pod couldn’t be easier: just hold the cartridge upside down and twist the base of the pod to access the filling slot. If using a new pod, make sure to let it set for 3-5 minutes after filling to make sure your e-liquid has soaked into the wick. Innokin EQ boasts a range of impressive features and a large 800mAh battery.